Tonight proved to be very exciting for Col and I as we devoured the first of our lettuce leaves! The recipe is a weight watchers one, however we were lacking a few ingredients and changed it to suit. 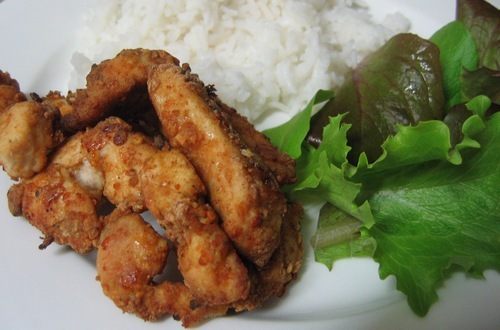 Cripsy Chicken – tastes much better then KFC! We served ours up with our lettuce and some steamed rice. That chicken sounds delicious …. and easy. I’m going to give it a try. There’s nothing better than homegrown lettuce, either! That looks so nice that I’ve sent the recipe home to try on Ant – am close to salvating already, we can have it with homegrown spinach leaves – yay for people with their own produce gardens! Oh how exciting! Your chicken looks absolutely delicious! My kids and I have been looking for a KFC alternative- this one looks really yum. Thanks for sharing it!